Different from the Family Guy one? I think not! Fast Animals/Slow Children was an original concept introduced on the TV show Family Guy. 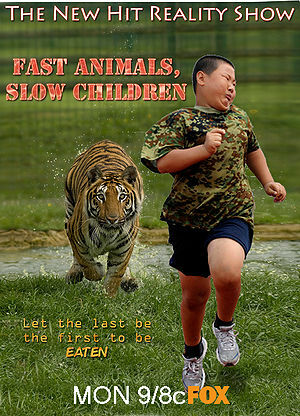 FOX decided to make “Fast Animals Slow Children” into the real thing after the great success of the reality show Fat Kids Can’t Hunt. Factoid: The show's pilot episode was strung together entirely from previously unusable FKCH footage. FASC’s premise is rather simple: Let a heavy child free into the wild jungle. The jungle is full of fast hungry animals. Watch how the animals catch the fatty. (Intersperse tense moments with commercial advertisements.) Watch how the animals devour the tender vittle with extreme pleasure. Show preview for next weeks episode. 5.1 Season 1: Hungry Animals never had it easier. 6 Want to be a part of the program? 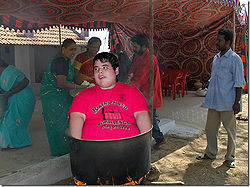 One anorexic boy, so that fat kids can trash him before being eaten. 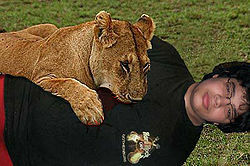 The show began airing on some random date with a two hour premiere, but due to the fact that most contestants got eaten in the first hour by hungry lions , tigers and wolves, the rating of the second part of the first episode dropped considerably, as the sadistic masses who watch TV only desire to see a bloodshed. Due to this, the network decided to include a new cast every episode, so as to keep the bloodshed going on every episode, and loyal viewers hooked to the TV. This action was also deemed as an effective measure to fighting childhood obesity, and is being considered by the government of the US to gather all fat boys into the show, to eliminate the obese plague. After some weeks of its release, due to the large amounts of meat consumed by animals, some had heart failure, and other just got simply obese and couldn’t run their prey. Several social and wild life protection groups, such as Green Peace protested against the show, as being a vile source of entertainment by torturing animals overfeeding them. So, due to this, next season, to replace the hungry animals, Fox will introduce Hannibal Lecter to the show, along with some other fine cannibals. Also, Other groups protested on the use that was being given to the fat children. They claimed that it was a complete waste feeding dumb animals with such large amounts of meat when the meat of those fatties could be used to feed the entire third world and end world hunger. To hush these complains, FOX donated 300 american obese kids to African communities, where they were slaughtered and cooked. Before FOX took over the idea, this was the original clip broadcasted on family guy. Season 1: Hungry Animals never had it easier. 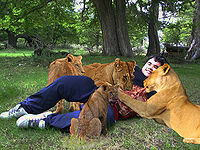 Lions converge on one fatty in charity to smaller lions. The first season is considered by many to be the best one ever on Television History, not only due to the novelty value, blood and chases (though very short, as fatties are slow, and never get far before an animal gets them), but also due to the educative value of it, as animal habits and preferences were discovered by the filming of the show. 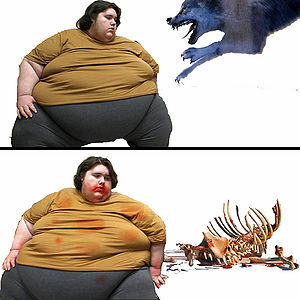 For example, it was seen that lions prefer morbidly obese teen’s meat, given the choice, while wolves prefer young chubby children flesh, as it’s easier to hunt and kill. Still, after 30 episodes, the show lost some ratings, as animals became overweight and slow themselves due to the high amounts of meat they had consumed. To try to keep up the bloodshed, Fox Producers introduced the idea of tying up fatties in a plate, placing an apple in their mouths, and let the animals eat without chasing, just going near the already immobilized prey and eat them. 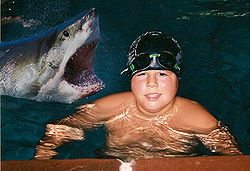 The idea was not very well accepted, but only due to the fact that, heavy children being unable of squealing of pain while being eaten, reduced its attractiveness. Trying to improve this, FOX producers promised the inclusion of a new deadly and vile animal for next season: Cannibals. The season moves its seating to a small cannibal village, and instead of having several fat kids running for their lives in each episode, only one grossly obese kid or teen was shown in each episode, as such a big prey could feed the entire cannibal village. This generated much criticism, as fans claimed that no serious TV show can have only one death per episode, but, others claimed that it was much better to have one death per show, as more bloody details of the killing were shown, such as the slaughtering, opening and serving of the chubbies. 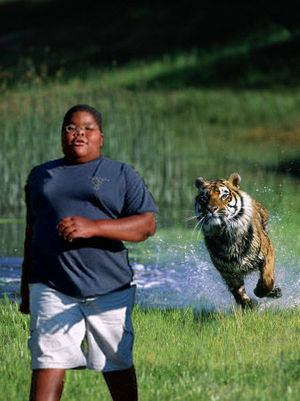 To everyone’s surprise, at the two hour premiere of this season, Fast Animals featured in the first season, such as Lions, Tigers, Wolves, and the like, returned to chase fatties. This took ratings to the roof again, and after the first episode, they show returned to its initial idea of having animals hunt down fatties. To keep the show fresh, Fox Producers, every now and then, broadcasted an episode in which a group of different fat kids where taken to a slaughter house and their meat was later packed up. Then documentarists would take this meat to places where world hunger was worst, ending their suffering by giving them food for life. For the fourth Season, animals got rather slow, and producers decided to introduce a very dangerous species to the game: Really hungry slow children. 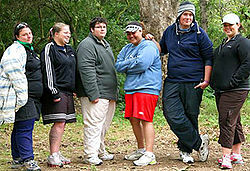 These fatties rapidly did not only devour other fat contestants, but also, ate several of the so called fast animals. Due to this, the newly introduced hungry kids got fatter and slower, and, rapidly, decided to move in herds, as the fast animals quickly fled at the presence of so many fatties. Still, when one of these fatties separated from the main group, packs of coordinated animals hunted down and eat the flesh-full fatty. The unreleased or "secret" season was the biggest mistake it reality TV history. Although no one knows for sure what really happened, 14 minutes and 32 seconds of video shows that one of the fatties became hungry on the trip over to the island and ended up eating all of the contestants, camera men and pilots. 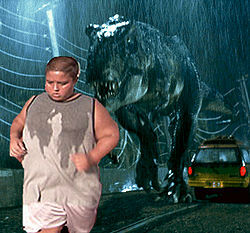 an elite team of fat kid hunters tracked down the round monster, and removed him for the island for the sake of the wildlife. he was relocated to a small town in southern Ontario Canada, but the exact location is unknown. Although this beast is under constant watch, there is still a large fear that it will strike again. The unreleased season was supposed to be kept a secret, but after one of the producers could not handle the thought, of what he saw on what little recorded video there was, and hung himself in his bathroom. The information supplied was found in his suicide note. Want to be a part of the program? It’s rather easy, actually. You only have to be between 0 to 18 years old, and be as fat as a sumo wrestler, and be slow running/walking/or any movement. In preference, you should be willing to bathe yourself in spicy sauce before filming, so as to make your flesh tastier to the wild animals (and attract them faster, too), and be an American, as the obese epidemic must be eradicated from the USA. NOTE: If you do fulfill these requirements, but you don’t want to participate, be advised, that you’ll be dragged into the show anyway, and be placed on the jungle with hungry animals so they can feast on your flesh. If you really, really don’t want to die, go and exercise fatty! FOX interest in keeping the people entertained has taken producers to start thinking of a new show, with similar premises as this one. One of the spin offs to this show will be released soon, and it will be called “Fast Fish Slow Children”, which is basically the same stupid thing, only on water. Casting of this spin-off has already begun, calling for any Child or teen with any resemblance to a Walrus or a Manatee, so as to make it easier for fast hungry sharks to decide to attack on them. Also, another requirement is that the body fat of the contestants should be higher than 40 % of their weight, which will guarantee slow speeds and ensure an aquatic epic bloodshed of fatties. Also, FOX executives have paid of some genetic research fellows to revive some dinosaurs and make another spin-off called “Fast Dinosaurs Slow Children”, with which they hope to gain the sci-fi public onto the show as well. This page was last edited on 11 September 2012, at 02:29.